This entry was posted in DXpedition, IOTA, Trip on 2019-01-20 by Martin Atherton. 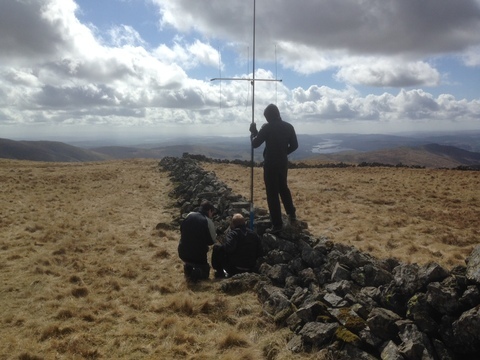 Between the 24th and 26 March 2017, five CUWS members activated two SOTAs in Snowdonia. 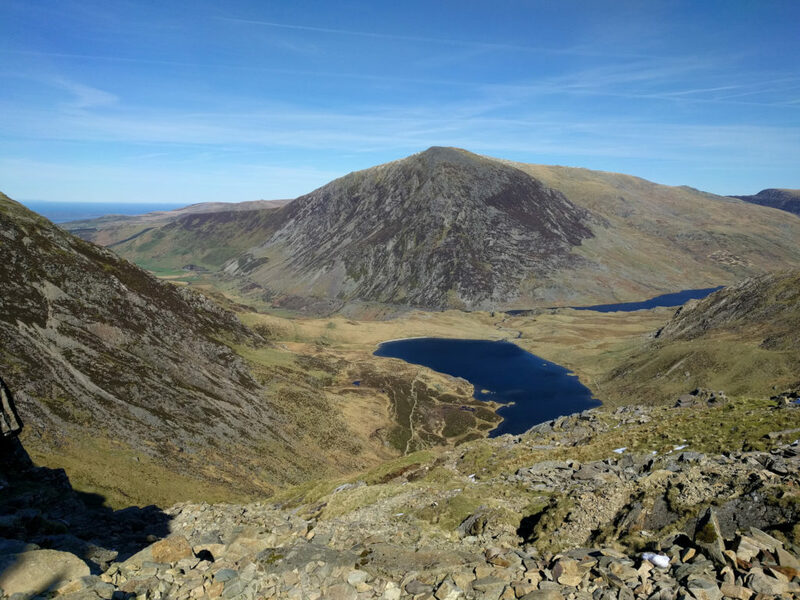 Jonathan GW2HFR, Dom M0BLF, Nige M0HZR , Rob M0VFC and William M0ZXA climbed Y Garn (GW/NW-004) on the 25th and Moel Eilio (GW/NW-022) on the Sunday. Unlike some previous CUWS SOTA trips, the weather was remarkably pleasant (other than a slightly chilly first night) resulting in good views from the top. 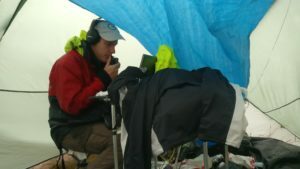 The bands were very active – favourable conditions and the coinciding CQWW WPX contest made it very easy for all operators to exceed the minimum required contacts and enjoy a couple of hours playing radio on the summits. In true CUWS fashion, the campsite chosen featured an on-site pub – although this year’s also featured a micro-brewery which together provided exactly what we all needed after a long day’s walk! This entry was posted in Social, SOTA, Trip on 2017-04-04 by William Clark. Six CUWS members (Jens DK2AB, Martin G3ZAY, Dom M0BLF, Rob M0VFC, Dan M0WUT, and William M0ZXA) visited Iceland between the 11th and 18th September 2016. 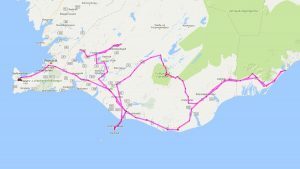 Three days (20th – 22nd) were spent operating from the Westman Islands (“Vestmannaejar” – EU-071) and the others were spent exploring the country – locations visited include Reykajvík, Ϸingvellir, Geysir, Gullfoss, Seljalandsfoss, Landmannalaugar, Skaftafell, Jökulsárlón and Skógarfos – quite the whistle-stop tour! Our APRS track is shown below. Despite all this travelling, some extra time allowed us to opportunistically activate an Icelandic SOTA, Hjörleifshöfði (TF/SL-216.) This was the first time it had been activated, as the Icelandic SOTA association was commenced two weeks earlier on September 1st. For QSL information see QRZ.com entries for home callsigns. This entry was posted in DXpedition, IOTA, SOTA, TF, Trip on 2016-09-28 by William Clark. 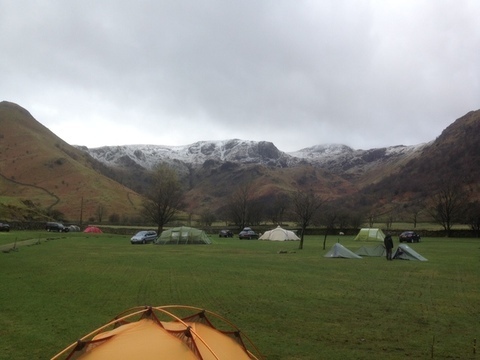 From the 10th to the 12th of April 2015, a handful of CUWS members embarked on a long and arduous SOTA mission to the Lake District. Along the way, we’d face such dangers as the British motorway system, a stiff breeze, and campsite badgers. Present on the expedition were Rob Chipperfield (M0VFC), Dom Smith (M0BLF), David Turner (M0TNR), Dan McGraw (M0WUT) and me, then the proud owner of M6IKY. Most of dream-team departed from Cambridge Friday in a couple of cars, picking up Dan from a train station. A long drive and several service stations later, we arrived at the campsite. We were duly warned about the campsite badgers (dangerous, hungry creatures apparently), then proceeded to make camp as the wind built. We woke to wind, snow on the mountains, and rain in the foothills, but we were all keen to get going, so we started up the first hill, Stony Cove Pike (2503’, LD-018). The ascent went well and in no time we were setting up various antennae on the summit. Due to solar activity, the HF bands were inaccessible at best, but some local VHF contacts were made. After a quick lunch, we decided that the next planned summit was going to take too long in the adverse weather conditions, so two smaller peaks were found: Little Mell Fell (1657’, LD-037) and Great Mell Fell (1762’, LD-035). More contacts were had at the top of both summits, most interestingly with another pair of radio amateurs (both called Victor, G4ONL and G4TDM) from Ireland who we proceeded to swap summits with. which we narrowly lost after a series of questions about golf and celebrities which were not our specialist subjects! Initially the plan for the final day was to find some more peaks, but we found that the pass was blocked with snow when we got up. Rob bravely tried to get over, but the intrepid Škoda was defeated by a particularly steep section. 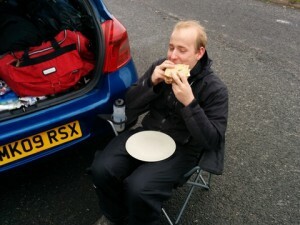 Mildly discouraged, we decided that going to the Blackpool amateur radio rally was a better idea. Some members spoke to friends of theirs, some got signed up to the RSGB, others bought suspiciously-large toroids for an unspecified project involving a band-pass filter; a fairly typical mix, we felt. Having spent a couple of hours bumbling around and bumping into the two Victors from the previous day we called it a day with some bacon sandwiches and headed for home. This entry was posted in Social, SOTA, Trip on 2015-05-09 by . From Monday 2nd – Friday 6th December 2013, G3VFC, G3ZAY, M0BLF, M0VFC and M1BXF will be operating as ZD8UW from Green Mountain, Ascension Island. We’ll be active on 40m-10m, mainly SSB and CW. (Being equatorial, there’s little point in taking the extra weight for 80m, I’m afraid.) There may also be some WSPR operation overnight. The best time for the path to the UK is likely to be in the mid-mornings on 17m and 15m, or the mid-afternoons on 12m and 15m. We’ll be operating with Elecraft K3s. We won’t have internet access at the QTH, but logs should be uploaded roughly daily to Clublog. 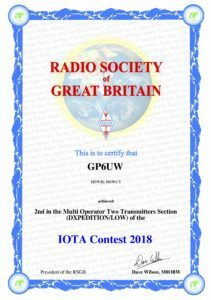 The logs will also go on LoTW once we’re back, but we can’t apply for the LoTW certificate in advance as we won’t be collecting the radio licence until we get to Ascension. QSL will be via M0OXO. 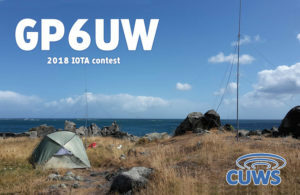 This entry was posted in DXpedition, IOTA, Trip, ZD8 on 2013-12-06 by . 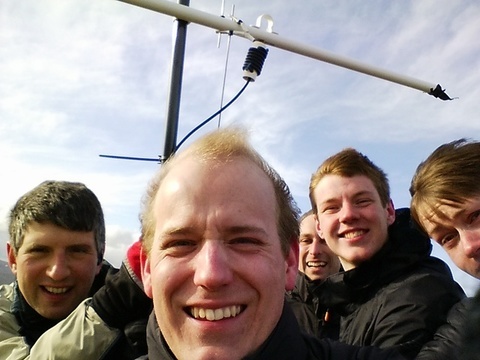 Five CUWS members (Martin G3ZAY, Michael M0GXM, Greg MD0IGD, William M0ZXA and Gavin M1BXF) went to the Faroe Islands from the 17th to 24th June 2013. We stayed in three youth hostels – for the first four nights we were in the Faroese capital Torshavn, then one night in Gjov and two in Sandavagur. The equipment was two Elecraft K3’s, one Yaesu FT100 and a Yaesu FT-817, plus a Spectrum transverter for 4m. Antennas included vertical antennas, vertical dipoles, slanted dipoles and a quad antenna for 6m. QSL for OY/G3ZAY, OY/M1BXF and OY/M0ZXA via G3ZAY. QSL for OY/M0GXM via M0GXM. QSL for OY/MD0IGD via MD0IGD. This entry was posted in DXpedition, IOTA, OY, Trip on 2013-06-24 by . In September 2011, 6 CUWS members (G3ZAY, G4EAG, M0BLF, M0VFC, M0TOC and M1BXF) went to Miquelon Island. Miquelon is the largest island in St Pierre et Miquelon, which is a French-owned territory just off the coast of Newfoundland. We stayed in the Motel de Miquelon, a very ham-friendly establishment right on the coast of Miquelon. QSL via home calls – for cards from multiple operators, QSL via G3ZAY. A total of 17920 contacts were made with 124 DXCC entities using RTTY, SSB and CW, on 10m – 80m. The log contained 9272 unique callsigns, with 74 people who worked all 6 operators. This entry was posted in DXpedition, FP, IOTA, Trip on 2011-09-29 by . 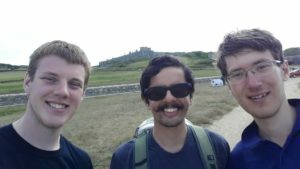 From 23rd to 30th September 2011, six members of the Cambridge University Wireless Society are active from St Pierre et Miquelon, a couple of French-owned islands off the south coast of Newfoundland. On the trip are G3ZAY, G4EAG, M0BLF, M0TOC, M0VFC and M1BXF. We’re active on 80m-10m in SSB, CW and RTTY. As of 27th September, we’ve made over 10,00 QSOs already. 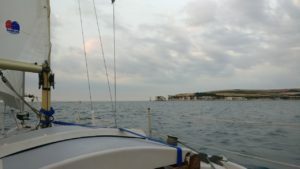 This entry was posted in DXpedition, Social, Trip on 2011-09-27 by . Six CUWS members (Martin G3ZAY, Michael G7VJR, Tom M0TJH, Gordon G3USR, Simon G4EAG and Hugo M0HSW) were on the air as ZD8UW from Ascension Island (AF-003) between 1 January and 9 January 2009. We were active on all HF bands, both SSB and CW. We were on Green Mountain, with a clear view to the horizon from about 210 degrees to 45 degrees. Other paths were totally blocked by the mountain. We don’t need your card if you don’t need ours! If you are happy with an LoTW confirmation then please save the planet. We were spotted 2110 times. Best DX: ZL taking into account our QTH! Also KH6 (even on 80M), KL7, UA0 on 160M, various exotica such as PY0, YS, HK, EP, JY, XW, OD, EL, OA, ST, HS. Weirdest DX: TN on 160M (Republic of Congo). Not far away, but truly rare. Other African DX included Cameroon and Angola. This entry was posted in DXpedition, IOTA, Trip, ZD8 on 2009-01-09 by .